The Krige family has owned this property for many years. The place was founded by their grandfather, Paul Sauer. The name of the place comes from the Dutch word "kopje" which refers to the top of the hill...and way back in the 17th century, on this hill, a canon was fired to alert local farmers that a Dutch East India trading ship had docked and they ought to go barter their produce for goods brought by boat from who-knows-where. Kanonkop is one of the real gems from South Africa. Their winemaking history goes back to 1973 from a commercial perspective. I had a chance to taste through a range of wines and vintages in early 2014...impressive was how well the Pinotage ages, for example. Their Pinotage tasted great as a young wine, but a more than 10 year old vintage was really elegant and remarkably complex. It is a label which I've found to be reliable...the quality is good and their two higher-priced wines are gems and of world class quality. Today they farm about 100 hectares, just about all of it being planted with red grapes. This Stellenbosch estate is regarded by many as a reference point for Pinotage. Their proprietary red wine called "Paul Sauer" is one of South Africa's most sought-after wines. It's typically aged in new Nevers oak barrels, so the wine tends to show a fair bit of woodsy, cedary oak notes on the palate and bouquet. Cabernet Sauvignon is the base, with a bit of Cab Franc and Merlot. The vines are 24 years old on average, so they're mature and producing something like 2 tons per acres. We have the delightful and youthful 2011 in stock. It's 70% Cabernet Sauvignon, 18% Cabernet Franc and 12% Merlot. Matured for 24 months in brand new French oak, so you'll easily detect the woodsy bouquet of this wine. Very fine now and yet it can be cellared another decade, if you like. "Kadette" is a secondary level wine and intended for immediate drinking, rather than cellaring. The 2015 is a blend of Pinotage, Cabernet Sauvignon and Merlot. No Cabernet Franc this vintage.. It's a berryish, soft, dry red with fairly low acidity...it's more fruit-driven though it does get some time in small wood cooperage, though the wood is typically second and third fill barrels. Pinotage is seriously good here...they have really old vines of this variety and make a deep, dark, woodsy wine. It's a well-made red wine and a good deal more complex than most Pinotage. Further, it avoids that "burnt rubber" sort of character which we find from time to time in South African red wines. The 2012 has lots of dark berries (blackberry and maybe cranberry) and the brushy, woodsy notes are interesting and complex. They use a high percentage of new oak barrels for this wine and yet there's enough Pinotage here to stand up to the wood. Andrea Mullineux is a Bay Area native who says wine was a part of her family life as she grew up and that exposure seems to have had a very good impact on her. She studied at UC Davis before working some harvests in Napa, followed by a vintage in South Africa's Stellenbosch region. She came back to the Northern Hemisphere where she did some industrial espionage in France's Southern Rh�ne. Attending a celebratory wine festival in Champagne, she met her future husband, Chris and the couple went back to his native South Africa where they launched a small wine production in 2007. He had worked at South Africa's de Trafford and Rustenberg wineries. They chose the Swartland region, thinking that the granite and schist soils could produce some remarkably soulful wines. Clearly they're on the right track. We were pleasantly surprised when we first tasted the wines and met Andrea. "Old Vines" white comes from seven different parcels of vineyards and it's a blend of five different grape varieties. Chenin Blanc takes center stage. There's Grenache Blanc from an 8 year old vineyard, while the Chenin Blanc vines range in age from 38 to about 65. There's a 41 year old Clairette Blanc vineyard and the Semillon comes from a 57 year old vineyard. The Viognier vineyard is 18 years of age. The recipe for this wine calls for chilling the just-picked grapes, whole-cluster pressing and then allowing the juice to settle overnight. The juice goes into barrel and the juice is fermented using indigenous yeast. They say the fermentation typically bubbles along for about 8 weeks. It undergoes a malolactic fermentation and the wine remains on the spent yeast before the barrels are racked and blended. Bottling takes place without filtration. There's a nice green apple character of the Chenin Blanc and we like the stony notes on the nose and palate. It's a delightful bottle of wine and seems to be developing a bit more complexity as it ages. Even with the grape varieties one normally finds in the Rh�ne Valley, this wine tips its cap to Loire Valley whites such as Savenni�res, Saumur, etc. If we mentioned Vouvray, some people would shy away thinking it's got some sweetness. In fact, it's quite dry and reasonably crisp. When we tasted their Syrah we found a wine that reminded us of a number of favorite Northern Rh�ne wines. In fact we queried Andrea about this, saying she must have experience in tasting/appreciating/imbibing wines from Cornas and C�te-R�tie. In fact, this was the case as she mentioned some favorite vignerons there. Mullineux 2015 is made entirely of Syrah. The grapes come from seven sites. They're big on trumpeting the virtues of the soil types, a detail few consumers care that much about. We've never had a customer ask if we have a Syrah grown on shale and schist. Or granite soils. We've never had someone ask if we have a Syrah from iron-rich vineyard sites. But here you have all of those. The vineyards are matured, but not ancient. Twenty to 27 years of age we're told. They de-stemmed half of the fruit and added whole bunches to the fermentation tanks. It took a few days for the fermentation to kick off. The fermentation lasted a week, or so, but the skins remained in contact with the wine for three to seven weeks, according to the level of tannin extraction. Despite the extended skin contact time, they're not looking to make a Barolo. Maturation takes place in barriques, puncheons and foudre. No filtering. No fining. They've done a good job in producing a South African Syrah with a slight French accent. It's showing handsomely presently and likely will continue to grow and become more complex with additional cellaring. They make some single terroir wines...Chenin Blancs from Schist, Granite and Quartz sites. There are Syrahs from Granite, Schist and Iron terroirs. We can't say we found the Chenin Blancs to quite justify the $90 price tags. The Syrahs go for about $120 a bottle and we can show you some C�te-R�tie and other spiffy Rh�nes we like in that price range. If you want to special order the Single Terroir wines, let us know. A wealthy business man from South Africa started this little enterprise in 1994. Gerrit T. Ferreira made his money in banking and insurance. He had purchased a little estate in the Stellenbosch region as a residential get-away. But it soon became apparent, given the area was already producing some good wines, that maybe planting a vineyard would be an interesting idea. They have several vineyard sites, but the main one is within sniffing distance of the winery. They have a fair bit of acreage on the Simonsberg hills, a mere 3 miles from the town of Stellenbosch. About 60 miles south of the main vineyard site is their "Siberia" property. This is in the Hemel-en-Aarde Valley (Walker Bay area) and there they've planted Chardonnay, Sauvignon Blanc, Semillon, Grenache and Shiraz. Their Highland estate (Elgin) is nearly in between Siberia and the Stellenbosch property and that's planted to Chardonnay and Sauvignon Blanc with just a tiny parcel of Semillon. The winemaker for this lovely project is Miles Mossop, who's had practical experiences in France's Rhone Valley, Italy's Sicilia, Australia's Clare Valley, as well as at the famous Thelema winery in New Zealand. He's now got more than a dozen harvests under his belt at Tokara and the wines are terrific. 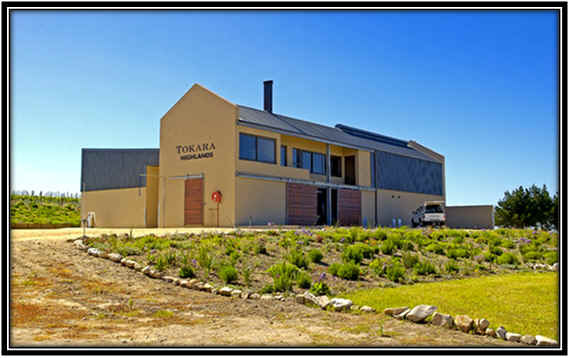 Tokara also cultivates a number of different types of olives and they produce several bottlings of oil. They also have a deli, if you're in the neighborhood and up for a picnic. Or you can book at table at their fancy little restaurant where they showcase their wines. We included a couple of Tokara Sauvignon Blancs in a blind-tasting and the wines. I liked their Elgin Reserve, but both that and the entry-level bottling showed nicely. Of serious quality are their Directors Reserve wines. Even more remarkable is the Director's White. It's 74% Sauvignon Blanc and 24% Semillon, reminding us of our favorite (and now very expensive) White Bordeaux from Chateau Smith Haut-Lafitte. They use puncheons for fermenting the Sauvignon Blanc and smaller barriques for the Semillon, with maybe 30% of the wood being brand new. We've had bottles of this open in our tasting room and it routinely impresses tasters sufficiently that they're more than willing to part with $37 to take a bottle (or more) home with them. We'd seen this winery's name mentioned from time to time as one of the prime Burgundian estates in South Africa. Finally, years ago, we'd had a chance to taste their wines and these guys certainly have the right idea about Chardonnay! They're in a cool climate region called Walker Bay. The growing season features breezes blowing in off the Atlantic which moderates the temperatures. The founder, Tim Hamilton Russell, had been looking for a southerly site which would moderate the ripening of noble varieties such as Chardonnay, Pinot Noir and a few others. He purchased 175 hectares and planted a few with various grapes. In 1991 his son Anthony took over with the idea of focusing solely on Pinot Noir and Chardonnay. He further designated the winery as an "Estate," which means they cannot purchase grapes to augment their production. They can only utilize fruit from their own vineyards. They have 30 hectares of Chardonnay, spread out amongst some 21 different parcels. The Hamilton Russell team crops its Chardonnay at a rather modest level, around 2 tons per acre. This, of course, can account for greater intensity of character in the grapes. Their soils are stony which may account for the lovely minerality of this wine. But it's got amazing depth and intensity, featuring a wonderful toasty character and a hint of smoke. Exceptionally complete. This will be an eye-opener to folks who are as skeptical about South African wines as I was...The 2017 continues their tradition of excellence. Some 90% of the wine was in French oak...a small amount was in foudre, a tiny quantity was in a concrete egg and five percent was in stainless steel. 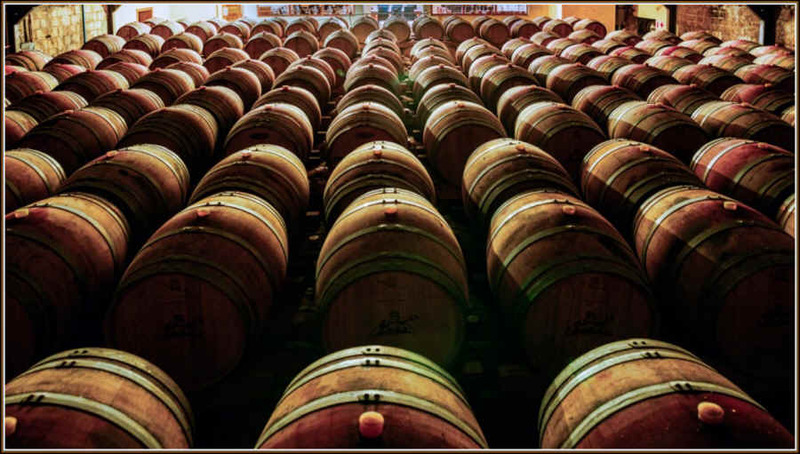 Their oak "secret" is the use of Fran�ois Freres barrels. These contribute a special fragrance and flavor. We should note, parenthetically, that a few years ago, the Chardonnay was cited by an American wine publication as being on their Top 100 list. Suddenly the wine became unavailable to us, despite our long-standing support of this wine. All these "new" accounts were demanding the wine and, to spread the love, the wine was doled out under the marketing guise of "building the brand." When updating this page (a couple of years following the great accolades for this wine) I decided to check a few web sites and, lo and behold, those companies who were allocated some cases of this, these days don't bother carrying the current vintage! It's no longer worth carrying if it doesn't have the approval of the so-called experts. Pinot Noir comprises some 22 hectares at Hamilton Russell and this is scattered over some 8 vineyard sites. Yields are typically rather low. That's part of their secret. Good French oak is another. They don't make a California-styled Pinot Noir, as the wine tends to be somewhat more akin to a good French wine. Lower alcohol. A bit of tannin. Serious wine. The 2017 Pinot Noir is quite good. It's really come along nicely the past several vintages. The wine is remarkably complex, showing dark cherry and some beet root tones. Medium-bodied and very fine. You may recognize the Bouchard name as it's that of a prominent family in France's Burgundy region. Finlayson is a name you may not be familiar with, but Peter Finlayson spent more than a decade in the cellars at Hamilton Russell, a world-class winery (noted above). In 1989 Finlayson and Paul Bouchard built a winery in the same neighborhood as Hamilton Russell, the Walker Bay region. They're in a valley called Hemel-en-Aarde (Heaven & Earth) and the winery specializes in Pinot Noir. Finlayson is, apparently, a fan of Italian wines and makes a 'minestrone' blend featuring Sangiovese (he calls the wine Hannibal! ), Pinot Noir and Nebbiolo, along with Shiraz, Mourvedre and Barbera! But Finlayson makes really nice Chardonnay. It's, for my taste, not quite as complex as the Hamilton Russell wine, but it is a rather good bottle of wine. This comes from a site called the Kaaimansgaat Vineyard from the Overberg appellation which is about an hour's drive east of the winery. It's at a higher altitude than the vineyards near the cellar. We have the 2014 in stock and this is a wine made along the lines of a White Burgundy...barrel fermented and left on the spent yeast sediment. It's still young and they seem to have the idea of making a wine that's going to grow and blossom with time in the bottle. This historical property traces wine growing back to the 1600s and it was the source of a world-famous sweet wine in the 1800s. The property changed hands numerous times and was in serious disrepair when the current owners purchased it in 1980. It took them until 1986 before they had their first vintage in this modern era of Klein Constantia. It's known that there were several types of Muscat cultivated in South Africa hundreds of years ago and the current owners, the Jooste family, did extensive research to try to produce a wine similar to the much-celebrated Vin de Constance of the 18th and 19th centuries. They think they're cultivating a clone of Muscat (de Frontignan) which came from vine-stock with roots going back to the original plantings. The wine is remarkable and it's a treat to taste and savor. The grapes are left on the vine until the shrivel up and dehydrate. They are not affected by botrytis and the picking tends to take place quite late in the season, well after the rest of the harvest has been completed. The juice is macerated with the skins for several days and it's fermented in two lots: one in stainless steel and one in 500 liter oak casks. It's slightly more than 12% alcohol, much like a Sauternes and it has, typically, about 150 grams of sugar per liter. What's especially amazing is its high level of acidity! This is golden in color and nicely fragrant, showing aromas reminiscent of lemon/lime and caramel. For having such residual sugar, you're a bit surprised on the finish as it's not syrupy at all. Though made of Muscat, it is not a wine which is "obviously Muscat." This is a far more subtle wine than typical Muscat. I've long seen this in the catalogue of the local distributor...and I've ordered a bottle numerous times in hopes of tasting this historic nectar. After someone unblocked it at the distributorship, we were finally able to buy a bottle and evaluate the wine...We tasted it and it was delicious...so we have a few bottles available for sale. Two insanely wealthy families, South Africa's Rupert clan and one of France's Rothschild's set up a wine company. There's still a Rupert & Rothschild Vignerons, run by the "kids" of the late founding fathers. And while there are wines made under the collaborative brand name, this enterprise is solely that of the Rupert family. I believe I did say "insanely wealthy," didn't I? The Anthonij Rupert wine comes out of an historic farm called L'Ormarins which the Rupert family bought in 1969. Anthonij Rupert died in a car crash in 2001 and old man Rupert passed away in 2006, so these days the eldest son of Anton Rupert, Johann, is at the helm of this business and a bunch of other concerns. To honor his late brother, he created the Anthonij Rupert label. We have the 2009 vintage of a Bordeaux-styled blend called Optima. It's comprised of Cabernet Sauvignon, Merlot and Cabernet Franc. The three varieties are vinified separately and matured for about a year and a half in small French oak. Then they assemble a blend of the three and the blend goes back into wood for another 6 months. Another nice feature is they don't rush the wine to market...they give it two years in bottle before sending it out of the winery. The wine displays lots of dark fruit notes...blackcurrant and maybe dark berry fruit with notes of cedar and mild vanillin. It's quite drinkable now and rather showy, too. The Cluver family has been farming in the Elgin area of South Africa, some 40 miles southeast of Capetown, since the late 1800s. In the mid-1980s they began planting some vineyards, finding the region might be well-suited to certain grape varieties. 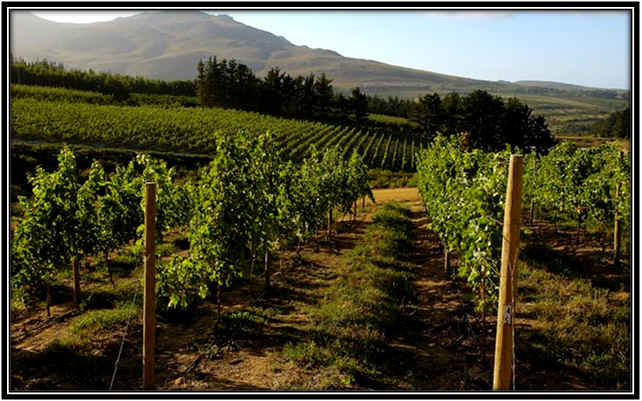 The vineyards are located within a UNESCO World Heritage site, something called the Kogelberg Biosphere. The Cluver estate comprises something like 2000 hectares and at least half is set aside for conservation purposes. We tasted a solid 2009 vintage Chardonnay. The wine is fermented using indigenous yeasts and nearly half the wine was in brand new French oak, the rest in second, third and fourth use cooperage. They left the wine on the spent yeast for nine months and a small percentage underwent malolactic fermentation, so it's faintly creamy along with the woodsy, apple/pear fruit and mild stony notes. Located some 15 kilometers from Stellenbosch and just five kilometers inland from False Bay, Meerlust has been run by the Myburgh family for 8 generations. The current owner studied at Germany's famed Geisenheim wine school and is said to have spent some time at Chateau Lafite-Rothschild in Bordeaux. For 25 vintages, a fellow from Friuli, Giorgio Dalla Cia was the winemaker. These days he's busy with his own little wine & grappa enterprise. Meerlust's wines are overseen by Chris Williams who had studied at the University of Michel Rolland in France. Luckily, he doesn't seem to put Rolland's fingerprints on the Meerlust wines and these remain rather "Old World" in style. Dalla Cia was well-versed in Merlot, as that grape is a mainstay in Northeastern Italy. He set up a good protocol during his management of the winery. Williams has built on that success. Meerlust's Merlot is a terrific wine and they fortify it with a small percentage of Cabernet Franc. The 2009 vintage is nicely-oaked and shows a bit of wood spice along with the mildly plummy Merlot. They are most famed for their Bordeaux-styled blend called "Rubicon", not to be confused with the wine made in the Napa Valley by Niebaum-Coppola. The 2012, quite a good bottle of wine, is 63% Cabernet Sauvignon, 18% Merlot, 14% Cabernet Franc and 5% Petit Verdot. French oak barrels, two-thirds new this vintage. They use a few different types of wood, adding to the complexity. Alliers and Nevers. It's an excellent bottle of wine and one worth brown-bagging for your wine expert friends. If they're good tasters, they'll likely peg it as Bordeaux or fancy Cabernet. Engelbrecht is a fellow whose family owns Rust-en-Vrede winery and Els would be famous golfer Ernie Els. Ernie Els own wine costs so much, you have to earn as much money as, say, Tiger Woods to be able to buy the wine regularly. The collaboration between Els and Engelbrecht is a tad less pricey. The press releases all tout Mr. Els' taste for Bordeaux and Mr. Engelbrecht's liking of Shiraz. The resulting blend is now made at their own winery, with the Bordeaux varieties dominating. This brand no longer exists. Els owns the Ernie Els brand. 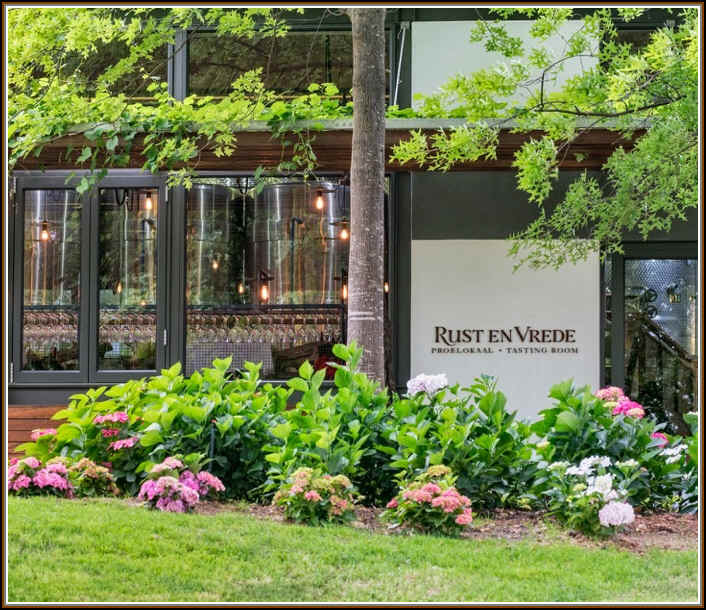 Engelbrecht owns or runs the Rust en Vrede winery. The Engelbrecht family runs this historic property, a place in the Stellenbosch. The winery specializes in red wines and Jannie Engelbrecht, a former rugby player, clings to the idea of maturing the wines for four years before releasing them. The estate is quite old, tracing its history back to the year 1694. The Engelbrechts took over the estate in 1977 and made their first vintage in 1978. Kevin Arnold was their winemaker at the outset. Now at that job is Coenie Snyman. The winery currently produces about 20,000 cases of wine annually and sends half of it around the planet. We've been following these wines for quite a while now and they've routinely been pretty good. Their "Estate" red wine is the top bottling, a blend of Cabernet, Shiraz and Merlot. It is matured for a bit less than two years in all new French oak barrels. The Cabernet is a bit earthy and has a smoky quality which Rust en Vrede fans really like. The Syrah is much in the same style, showing a woodsy note which I find sort of "burnt." Famous wines, however. 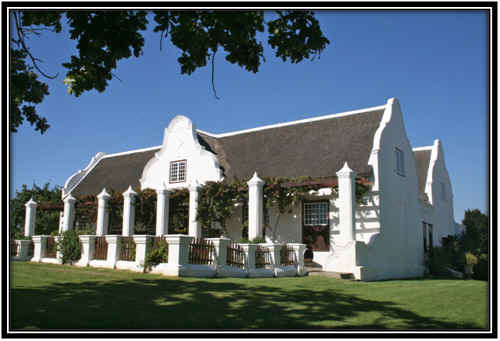 The Rustenberg estate has history going back to the late 1600s. Wine has been made there since the 1780s and they've been bottling their own since 1892. Whatever the history, they've been at it a long time. In the 1940s, the Barlow family bought Rustenberg and a neighboring estate which was originally part of Rustenberg (the old Schoongezicht estate...I'm glad they kept the name Rustenberg!). Simon Barlow runs the property and they make quite a range of wines. Most outstanding is their "Peter Barlow" bottling, a special bottling of Cabernet Sauvignon that's deep, dark and rich. It's been given the "royal treatment" with respect to oak...something like 70% of the barrels were brand new. This is showy now and ought to continue to develop (and soften) over the next ten years. The 2010 John Merriman is a Bordeaux-styled blend that goes head-to-head against Napa's top wines. It's predominantly Cabernet and Merlot with a few drops of Petit Verdot, Malbec and Cabernet Franc. It sees a fair bit of new French oak and we like the woodsy style of this wine. It's quite drinkable now and the modest price makes it a wine worth considering when a steak dinner is on the horizon. I believe this is a bottle-fermented bubbly based on Chardonnay, with Pinot Noir, Pinotage and Pinot Meunier...It's a perfectly pleasant, fairly dry, mildly zesty bubbly. A Boekenhout is some sort of tree found in South Africa and its wood is often used to make furniture, hence the various wooden chairs in the logo of the Boekenhoutskloof's label. The farm has been in the Franschhoek valley for hundreds of years, but this little winemaking enterprise only got started in the 1990s. The winemaker (and part-owner) is Marc Kent. The first vintage amounted to a few thousand bottles...now they're making well over a million, mostly under the Porcupine Ridge label. There's a wine called "The Chocolate Block" and it's a Syrah-based blend. It's 71% Syrah (not from the same site as their heavy-hitter Syrah bottling, though), 15% Grenache, 8% Cabernet Sauvignon, 5% Cinsault and a drop of Viognier. The Semillon is a nicely complex wine. First, it's made from seriously old vines. One block was planted in 1902 and the other in 1942! The wine starts its fermentation in tank and is quickly transferred to French oak. It undergoes a malolactic fermentation in barrel, as well and it stays in a very cold cellar in wood for about a year. It's got streaks of citrusy tones along with some peachy qualities...nice and dry with a bit of the 'waxy' character typical of Semillon. The Agter-Paarl region is located approximately 36 miles east (and a bit north) of Cape Town. The MAN Family Wines enterprise began when two brothers and a buddy of theirs began making a few hundred cases of wine back in 2001. Jos� Conde and Tyrrel and Philip Myburgh embarked on a little "weekend" hobby project. Jos� and Tyrrel already had winery jobs, while Phillip is involved as some sort of attorney. They make close to 200,000 cases of wine and work with some 30 growers. Most of the vineyards are dry-farmed and they're in an area that doesn't get much rain. All their growers, we're told, farm sustainably and have some sort of certification. The MAN name comes from the men having named the place after the wives: Marie, Anette and Nicky. Here in California, back in the 1970s, wineries made beautifully fruity Chenin Blanc in places such as the Napa Valley and Dry Creek Valley. But as demand for other, most costly types of wines became de rigueur, Chenin Blanc became relegated to places less hospitable in terms of quality wine. In this Agter-Paarl area, the combination of soil, climate and head-pruned vines produces relatively meager crop levels, allowing a winemaker to produce something of more interesting quality. And that's what these guys are doing. Combine that with sensible pricing and we are delighted to be able to offer such a delightful wine at a most attractive price. The wine is from the 2016 harvest. It's fermented somewhat cool, but not ice cold. Only free-run juice as they don't like the quality of the Chenin Blanc that's been squeezed to a fare-thee-well. The wine is kept in stainless steel...no wood. They leave it on the spent yeast for a few months and the resulting wine is a brilliant ten-buck bottle of dry white. Most old-timers think of Chenin Blanc as a fruity wine with a bit of sweetness. This has but a few grams-per-liter of residual sugar and it's below the threshold of what most people can taste. In fact, it's drier than many a California Chardonnay and, disturbingly, a number of high-priced Napa Valley Cabernets. We like the melon and peach sort of fruit tones here and we are especially delighted to find such a cool wine for a mere ten bucks. The Leopard's Leap project takes its name from a leap of real leopards in South Africa's Franschhoek Valley, about an hour's drive east of Cape Town. The brand is run under the management of Hein Koegelenberg, who's also the head of the La Motte winery (his wife's parents bought La Motte some years ago). The idea of Leopard's Leap is to produce modestly-priced, well-made wines which are everyday drinkers, not wines for collectors. We tasted a few different wines and found this Sauvignon Blanc to be nicely made and having good varietal character. It's a blend of grapes from Perdeberg (Agter-Paarl) and Durbanville (northeast of Cape Town and planted with grapes and wheat). It was fermented in stainless steel tanks at low temps to capture the fruit. The wine shows some mildly grassy and lime-like citrus tones. They left the wine on the spent yeast for a few months to give it a bit more body, but it's still a nice little light, crisp and dry white. It's not a fancy or complex wine, but it's not intended to be fancy or complex. You can pair it with seafood, sushi, a shrimp salad, etc. Sauvignon Blanc from this property seeed to be on every wine geek's list of "gotta-have" South African wines. The first vintages we tried, several years ago, were not as impressive as its press clippings led us to believe. Some vintages showed improvement and we thought this was quite good, but the past few bottlings we've tasted have missed the mark and not to our taste. We preferred the more intensely herbal, citrusy notes of past vintages. Lately the wine seems to have less focus and less character. Formerly owned by Larry Jacobs, the property was purchased by Fred Wypkema of "Hydro Holdings," some big corporate concern. Some were afraid this would adversely affect the wines at Mulderbosch. However, they'd retained the services of Mike Dobrovic who had been the winemaker since 1991 or 1992. The quality of the wines, especially Sauvignon Blanc, was quite good. The winery was sold in 2011 to Terroir Selections, the Charles Banks wine company. They owned California brands such as Mayacamas, Qupe and Sandhi. Qupe remains a staple in the Terroir portfolio, along with Wind Gap, Agartha and New Zealand's Trinity Hill. Banks had to sell his ownership in Mayacamas. Sandhi is owned by its original founders and money man Steve Webster. The current winemaker at Mulderbosch is a fellow named Adam Mason. 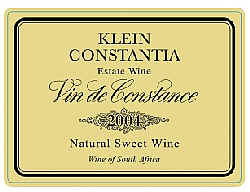 He has worked for Klein Constantia at one point. These days they've been getting good press for their single-vineyard Chenin Blanc wines...Some local wine writers have been shown these wines as Mulderbosch seems intent on promoting the wines. We checked the current offerings at the local distribution company and they don't seem to offer these. Further, they're a year, or two behind with Mulderbosch Rose and two or three years behind with Chenin Blanc and Sauvignon Blanc, suggesting sales have been a bit sluggish. Charles Banks, by the way, was sent to US Federal Prison in September of 2017, having been found guilty of defrauding former NBA basketball star, Tim Duncan. He's serving a four year sentence.